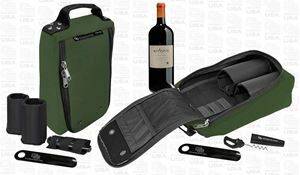 Premium, padded, plush nylon interior protects your wine or shoes and stands upright when loaded. Dual vent holes. Includes two removable Velcro wine bottle sleeves, deluxe wine bottle opener and a deluxe shoehorn. The wrap-around double zippers provide easy access to load your shoes. Made in USA. Limited lifetime warranty. Please note: This item is only available in the Major's signature green. Powered by nopCommerce Brainstation Copyright © 2019 H&B Quartermaster Store. All rights reserved.